Happy Meal and I had just finished up our delicious Bratwursts at Steingarten L.A. We were on our way home to clean up and then head off to see the dinosaur exhibit at the Los Angeles County Natural History Museum. 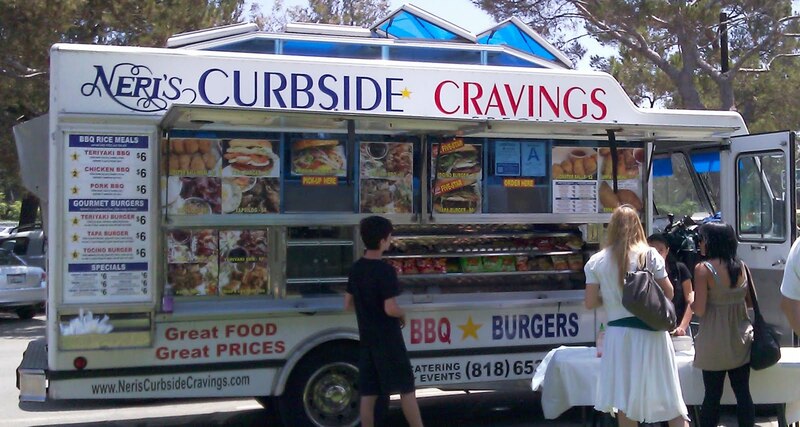 As we approached home, I noticed the Neri's Curbside Cravings truck. That truck had been on my list of places to try, and this was my moment. I performed a U-turn of questionable legality and deposited the car in the No Parking zone next to the food truck with Happy Meal strapped in to take the fall in case the cops showed up. The truck was catering a private event, and it was not actually open to the public. In harmonious concert, the forces of Capitalism and my devastating good looks quickly worked past that formality, and I was allowed to order the Tapa Burger. The Tapa Burger was described as a grilled marinated beef patty, topped with cilantro, tomato and egg, on a bed of a special mango-bell pepper slaw with garlic aioli spread ($6.00). Since Neri's Curbside Cravings specialized in Filipino fare, I broke with tradition, and I ordered the burger exactly as described. My burger was ready in about 12 minutes. I decided to eat it at home, which was only about a minute away from the truck's location. The Beef: The beef was surprisingly good--I had been expecting Chuck up until my first bite. Defying my expectations, this burger was strongly beefy, and it carried a firm note of iron. A follow-up call confirmed my suspicion that Neri's Curbside Cravings was rocking something more premium than Chuck. The were using Sirloin--bless them. It got better. They marinated the Sirloin for 2 days in a mixture of soy sauce, rice vinegar, and garlic. 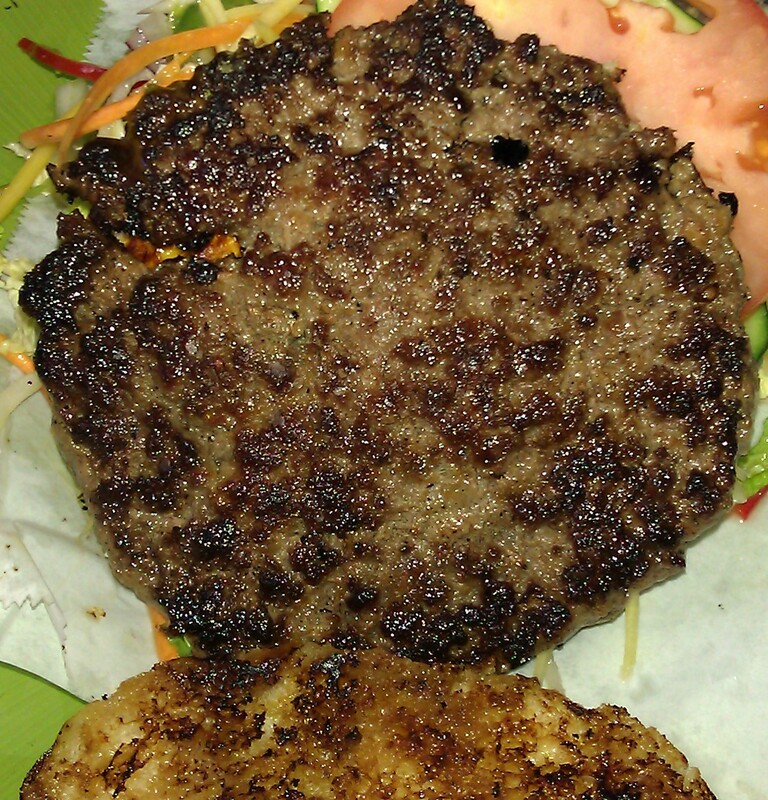 After leaving the marinade, the beef was ground (in-house) and formed into patties for the day. The resulting bite was flavorful, juicy, lean, and so very tender. The loosely packed, tender Sirloin very nearly melted in the mouth. When I tried this burger, I was not hungry. In spite of that, I had difficulty putting that delicious ground steak sandwich down. My guess was that the Tapa Burger was named for the seasoning/marinating process, although tapa, generally refers to dried or cured meat. The Seasoning: I couldn't detect additional seasoning on the exterior of the patty, but it was so flavorful from the marinade, that additional seasoning would have been unnecessary. The Sear: BOOM! Neri's Curbside Cravings applied a remarkably crisp sear to the thick, 8-ounce patty. The sear remained crisp throughout while I was enjoying the burger. Keep in mind that my burger was topped with a ton of wet stuff, so retaining crispness was quite a feat. The Preparation: The preparation of my burger was flawless. The beef was ground at a medium coarse setting. The burger was cooked to about Medium without me making any special requests. The flat-top/griddle in the back of that food truck must have been cranked up about as high as it could go. I appreciated that, because this imparted a crisp sear without over-cooking the burger patty. The beef was formed into patties with a gentle touch, so the proteins did not bind together to create chewiness. The Cheese: I didn't see any cheese on the menu, and I didn't ask for any. This was a burger that I didn't want to tweak too much, since I was not well-versed in the cuisine. 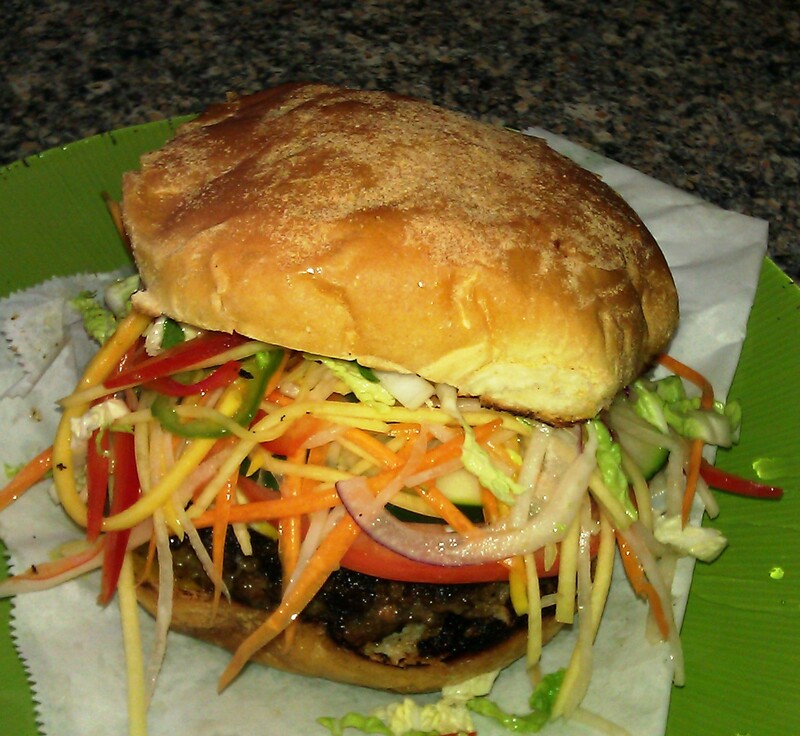 The Bun: Neri's Curbside Cravings baked their own buns. The bun was actually a Pan de Sel. This was a delicately sweet roll. It was fresh, moist, and very well toasted. The bottom bun did eventually become overwhelmed by the juicy beef, but this was a small price to pay for juicy, marinated Sirloin. The Meat To Bun Ratio: This was spot on. There was never a moment where I was aware of any breadiness. The Toppings: This was where the burger went from really good to great. The mangoes and bell peppers for the slaw were cut julienne-style in-house. This slaw was like a delicate and crunchy sunomono. It was cut finely enough that it easily compressed when bitten. I would have eaten the slaw as a side, too. It was delicious. They slipped some lettuce, carrots, and red onion into the mix. It was all perfectly fresh and crisp. The tomato slice blended into the background, but it provided some fill for the texture of the slaw. I rarely order my burgers with egg on top, but in this case, I am glad that I let it all happen. The egg was cooked Over-Medium, and it just worked. I suppose a burger with so much vegetation almost required an additional protein to balance out the bite. There was a garlic aioli in there somewhere, but it was subtle enough to blend into the background. The Fries: No fries...chips. I was fine with that. The Value: 6 bucks for a half-pound Sirloin burger. The beef was marinated for 48 hours and ground in-house. The bun was baked in house, and the bun was something of a rarity. The slaw was prepared in-house. The assemblage was absolutely delicious. The value was very good for the Tapa Burger at Neri's Curbside Cravings. Also, this food managed to wipe away my bad Filipino burger memories from Jollibee. Burger Review : If you see this truck....STOP and get a burger. If you have just eaten, it will not matter. 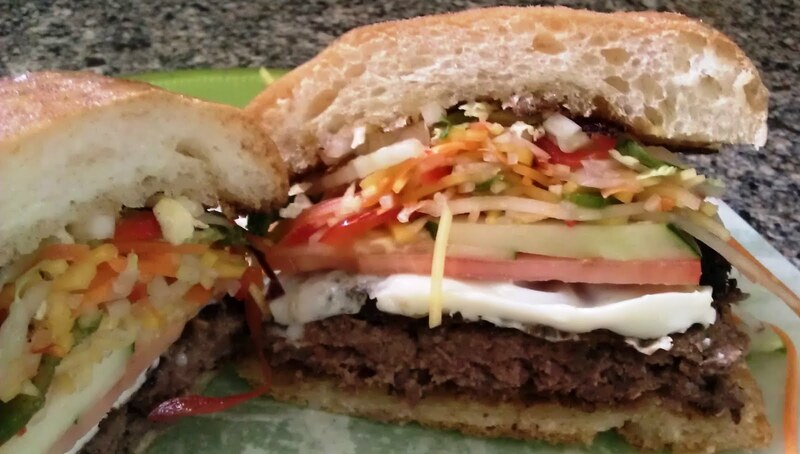 Stop and try the Tapa Burger from the Neri's Curbside Cravings truck. wow....this burger looks so yummy! cant wait to taste it!!! 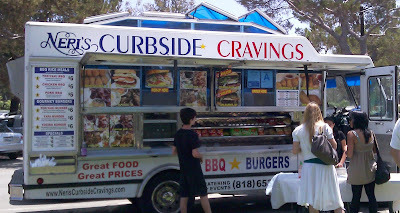 http://www.curbsidecraving.com/site/ This is where you will find the truck's schedule.